Depiction of the battle for Hill 203 during the Russo-Japanese war in 1905. The hill was eventually captured by Japanese forces after several assaults and at heavy loss of life on both sides. Stars Tatsuya Nakadai, Terry Aoi and Martha Natsume. 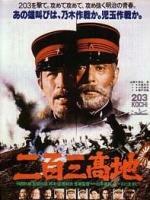 Also with Tetsuro Tamba and Toshiro Mifune as Emperor Meiji.